A better night of sleep is waiting for you just around the corner. With the world’s most luxurious comforter set, you’ll fall asleep instantly and stay asleep through the entire night. Add the Chevron Comforter 6-Piece Set to your bed and start sleeping better today! With a third of your life spent in bed, make sure that you’re enjoying every moment in a warm embrace of the silky soft brushed microfiber comforter. 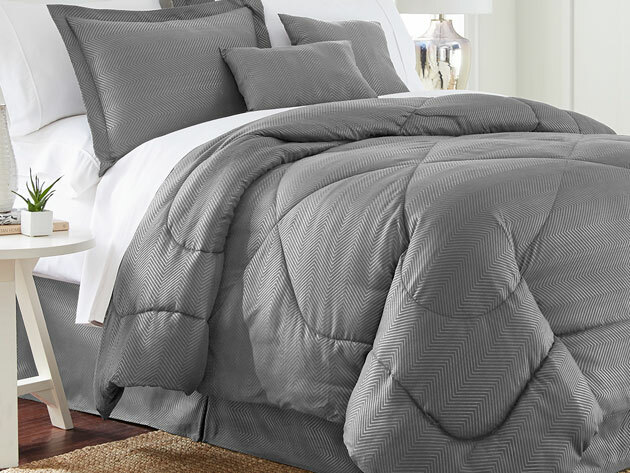 The Chevron Comforter is designed with a hypoallergenic polyester filling that feels luxurious to the touch. It’s also perfect for anybody who is allergic to traditional down. This material is built to keep you warm in the winter and cool during the summer. Best of all, the comforter will last you a long time due to the premium fabrics and expert stitching. Included in the Chevron Comforter 6-Piece Set is 1 comforter, 1-bed skirt, 2 shams, 1 decorative pillow, and 1 breakfast pillow. Each piece is the perfect addition for your bedroom. Choose between the four beautiful colors of aqua, white, ivory, or gray. Start getting a better night of sleep today with the Chevron Comforter 6-Piece Set. At 66% off, this luxurious comforter set will only cost you $40. Be sure to use the coupon SEMIANNUAL to get an additional 15% off, which brings your total down to $34.